The Church pub is one of Birmingham's hidden gems, off the beaten track in the Jewellery Quarter, an up and coming area of the city. The area is in that sweet spot of being relatively undiscovered by the student masses, but still being lively enough for whatever occasion you're looking for. The inside itself is very nicely furnished, with some smaller booths for a more intimate feel, as well as a more open area to evoke a more friendly vibe. The bar itself is well stocked with a variety of spirits, beer and wine to match whatever poison is of your choosing. There is also a dance room just across the corridor, especially valuable on the weekend where a DJ is usually playing indie and popular hits. If you're really lucky you'll be able to get a seat on the upstairs terrace on a warm summer evening. 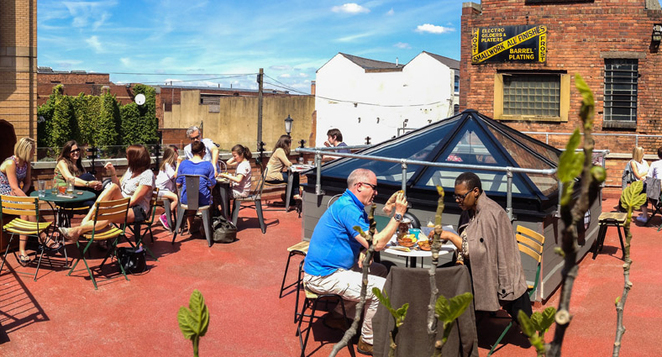 Obviously the rooftop is still in Birmingham, so the views are more of a gritty, industrial feel than a breathtaking New York feel, but it can be equally cool if you're of that persuasion. I've been to the Church twice now, once on a Thursday evening and once on a Saturday night. The difference is quite stark. On the Thursday evening the pub had a few groups floating around, mostly older locals in the area, but quiet enough that you can find a table with a fairly large party. We chose to sit upstairs on the terrace on an Indian summer sort of evening in September. As I suggested earlier, the atmosphere is more gritty than beautiful but its raw feel is very trendy at the moment. The menu is quite extensive, offering many deep southern American classics like gumbo, burritos and jambalaya. I went for one of the lighter bite fish burritos, which was extremely filling and at a perfectly reasonable price. The other excellent thing, I forgot to mention is the extensive number of cocktails the Church serve, perfect for a celebratory evening. The second time I went was a Saturday, which was a completely different atmosphere. The interior was bustling with a very mixed clientele, from young professionals and students, to older locals. The Church still do a good job at serving you relatively quickly even on busy nights seemingly. The dance room was open on this night and I was surprised at how intimate and pleasant the atmosphere was in there considering the mix of demographic. Again, the Church is extremely accommodating in terms of opening times, being open past 1am, making it the perfect flexible venue for whatever you're feeling, be it a unique dinner, celebratory drinks or some late night dancing. The Church is one of my favourite venues in Birmingham, unique to the city and, for the moment, relatively undiscovered in the best way possible.